My first year of University over, and I had two animated works complete, and was ready for the next year when I would start the Animation course proper. Both were well within the guidelines of the projects, and both were completed frame-by-frame in Photoshop. Not the best, but it served my needs, and while the works were animated, both were to show off the art in the animation rather than the animation itself. Christmas holdiays had come and gone, and the research fully completed. The project was now underway for more practical events. That being the construction of the animation itself. I'd already got some idea as to what the first animation would be. Having completed a walk through Hanley Park [which aptly became the title for the animation] before Christmas with notes and videos taken as per project guidelines, I planned to record in animated form the feelings of that walk. This would have been done through the use of colour. Also to include would have been how the lighting made me feel. So when the sun came out and struck the water of the pool, for example, the exact same would have been recorded with the character of the animation reacting how I had. What I didn't count on, though, was how long it would take to make each 'scene' for the animation. Using a 16-bit pixel style was a fundemental piece to the thinking of the project. Videogames are a journey. And each scene was designed with that aspect in mind. Taking inspiration from the Sonic the Hedgehog Mega Drive games, I planned to keep background and foreground the same. Only the middle would change. But even so, it still took a while for the six scenes that I would be testing with to be complete. The plan was to acurately try to recreate Hanley Park, as fully as possible. The plans I had drawn up included the whole of Hanley Park, from the southern entrance off College Road all the way to the College Road-Cleveland Road connection entrance. The same route I had walked at the beginning of the project. All six testing scenes cover only the southern area surrounding the pool. But it was those scenes I had to stick with. The time left until the exhibition started was drawing near, and apart from the scenes and a test run, nothing else had been completed. Deciding that I could at least get some more of the scenes complete, I stuck to it until I knew it couldn't be done. Knowing that time was of the essence, I chose to work on only those parts that were recognisable as parts of the park. These remained unfinished, as I put more work toward a character. Any hope of now adding in extra things was slim. The lighting effects wouldn't be able to be put in. The emotion with colour was never going to happen. It had gone from showing the impact of the walk to... just a walk. But the main point of the animation still remained - A Videogame is a Journey. The retro feel helped to show that greatly, and when it was shown off at the exhibition, the comments I recieved about it mostly said it felt very retro, or the fact that it could be recognised as Hanley Park. In effect, it was a success. But there were still things wrong that I felt I could improve on. For one, it was running only at ten frames per second. The jaggedness showed. The next thing was the walk itself. Since I had no character to test the walk on the first, I made a placeholder with a placeholder walking animation. That placeholder had to stay in, and as such, the legs moved stiff and the walk didn't look like a walk. These were really the only two parts that I felt had a massive impact on the animation itself. Well, apart from the fact that I never succeeded in doing what I wanted. And that is where the second animation comes in. With the Final Major Project, we set the rules of our project. I had recently got into the work of David Hockney and his self-named Joiners. Therefore, I wanted to go the route of making an animation based on angles. This was originally going to be a stop-motion animation with multiple viewpoints creating one scene. The planning, what I had done for it, was a fiasco. After talks with the tutor, he guided me to a more suitable route. That was, having liked what I had produced before, to continue with roughly the same thing. He knew I wanted to go down the animation route, and suggested that by keeping to the same style, it would create a comparison of the two and what improvements have been made. I knew the one singular improvement I wanted to make straight away. And that was to increase the frame rate from ten to something that would create smoother movement. I kept that in mind when planning for the future project I now had set in mind. I also decided to keep to the gaming theme. It had helped me before, and so it could do so now. Instead of just sticking with the one game, I went through multiple genres. I started at Pokémon. A sprite-filled overworld would help cement one connected world, but if exploring various angles, I needed more. Advance Wars used the same sprite-filled overworld, but swapped from a top down perspective to a more realistic side-on view. By combining the two, I felt I had created a perfect formula. And then the one game that fully showed what was possible found its way to me. The Legend of Zelda II. Having sat on my 3DS' memory since it was first given out, it was never touched. Through playing it, I saw all I needed to. Even if I didn't manage to get anywhere in the game itself. It was less possible to create angles in sprite form, and so I turned instead to an art style I hadn't used since high school. Basic cartoon visuals helped create the 2D segments, as I called them, while the overworld would be created in sprite form through the use of tiles. 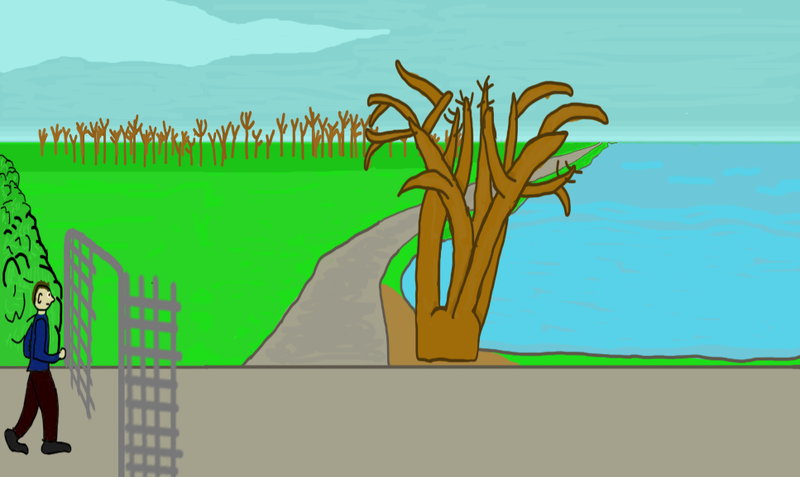 A basic map was created as soon as I had enough of the tiles, though one animatic was created using just road and building tiles only along the route the character would walk. This time, a lot more work was put in to complete all that needed to be done. The basic map complete, I felt it would be a lot more better if the map moved under the character to create the illusion of movement instead of a static zoomed out map. All the tiles were recreated to be bigger, and numerous more were added. A lot more of the map was fleshed out with roads and buildings, and a quarter of the map was dedicated to a cameo appearance from the road I live at. At least four 2D segments were planned - only two of which managed to get into the final production. These angles were ground level-up, bird's-eye-view, 2.5D, and forty-five degree camera rotation. A possible fifth would have been a typical 3D videogame camera view - that being over the character's head. The city acted as ground level-up, with the forest being the 2.5D section. Walking up the hill would have been the bird's-eye-view with walking past a row of houses the forty-five degree camera rotation. The 3D videogame perspective was more a bonus if everything else was complete, and as such I hadn't thought of anywhere to put it. The overworld was animated as one singular walk. Each of the 2D segments was worked on seperately. And it was these that took most of the corner-cutting. A second animatic will show the character walking halfway across the scene and looking up at a tall building before the camera shifts to the ground looking up. In the final product though, that was changed to almost as soon as the character walked on scene. The buildings themselves also didn't match what would have been seen from that angle, with supposed indented entrances not even showing their roof-lines. It was, again, reaching the time where the finished product was to be finished ready for exhibition. As a placeholder, I used the first draft, which had the full overworld walk and the first two 2D segments. That placeholder was used during testing. Working through the last few days left, it became clear that, despite having the last two 2D segments finished, the animation on them wouldn't be completed. As such, that first draft became the final product. This one was less a success in terms of what I'd set out to do, but the tutor was right. By continuing what I'd already started with the first animation, there were clear comparisons that could be made. Those are just three comparisons. I could list more, but this post isn't about making connections between the videos, rather giving a detailed insight as to the process of thought and design. This is one of the original designs for the first animation. Not a single inch of 16-bit graphics within it. I admit that I was drawn more to the cartoon style at first, but I was struggling for a reason to continue with it. It surely looks better, but without purpose, it serves nothing. I was looking for something other than a walk, something to tie it all together. When I arrived at the thought of videogames being a journey, it set off a number of thoughts about how I could continue from that point, not just with that project, but many more in the future. Although, I will admit, unless it serves a purpose, I wouldn't be returning to the 16-bit style in the future, even if the idea of videogames and animation still carries me on.